School begins at last for our girls, much to Kuina’s excitement and Hinako’s dismay. 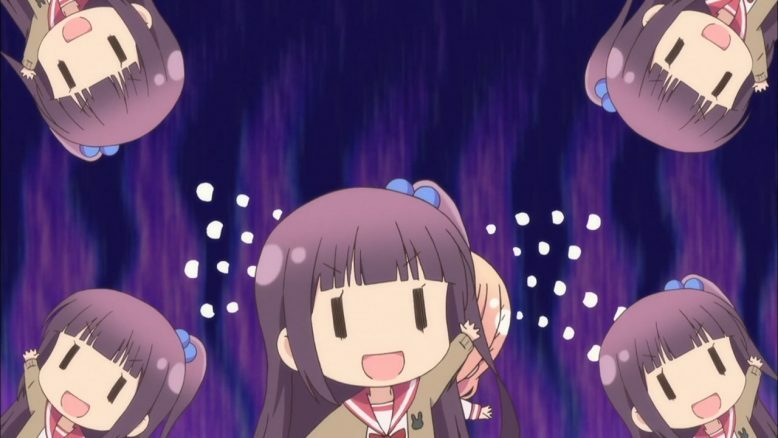 Not that either of those is surprising: Ku-chan is a bundle of energy who loves meeting new people and eating reading new books, while Hinako is a bundle of nerves who freezes up the instant she speaks to anyone she doesn’t know. This week introduces the last of the five main girls, Nakajima Yua, and her personality is much like I expected it to be based on the OP. She’s a tsundere who became infatuated with Chiaki after having seen Chiaki perform. 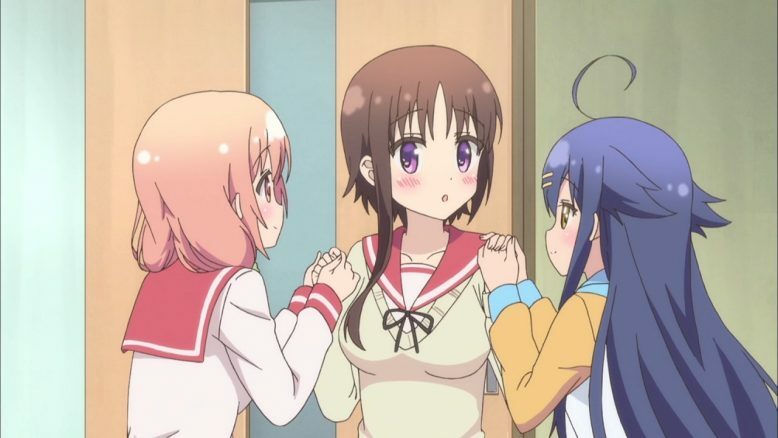 However, she also doesn’t think someone as timid as Hinako is suited to being friends with her idol, and seeing the two of them together gets her upset. I admit that while she’s acting like that I’d personally like to smack her upside the head and ask her who exactly she thinks she is to decide who Chiaki can and can’t be friends with. But honestly she isn’t a bad person, she just gets easily swept up in her emotions. 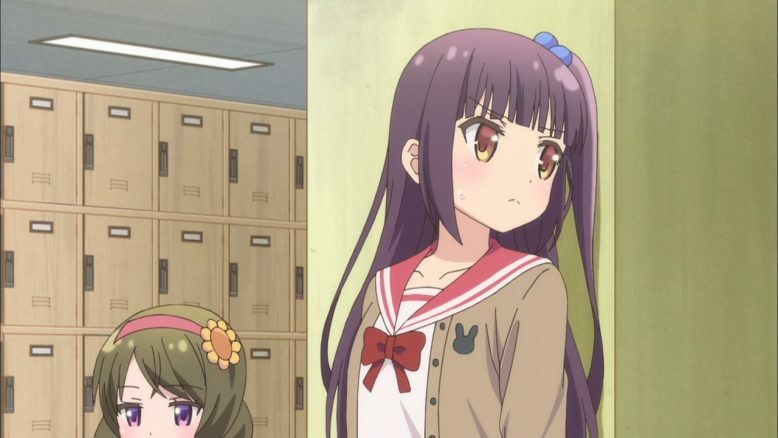 She feels guilty as soon as she sees Hinako driven to tears, and the idea that Hinako might have been too upset to come back to school after one encounter results in Yua waiting by the shoe lockers to watch for Hinako, worrying about what to do if she doesn’t come in. Yua’s tactics for trying to separate Hinako and Chiaki are interesting. She basically tries jumping in every time Hinako hesitates when asked something, offering to do it herself. Her intent, or so she says, is to prove that she is better than Hinako, and that Hinako is basically a failure. But her plan runs afoul of Hinako’s social anxiety. 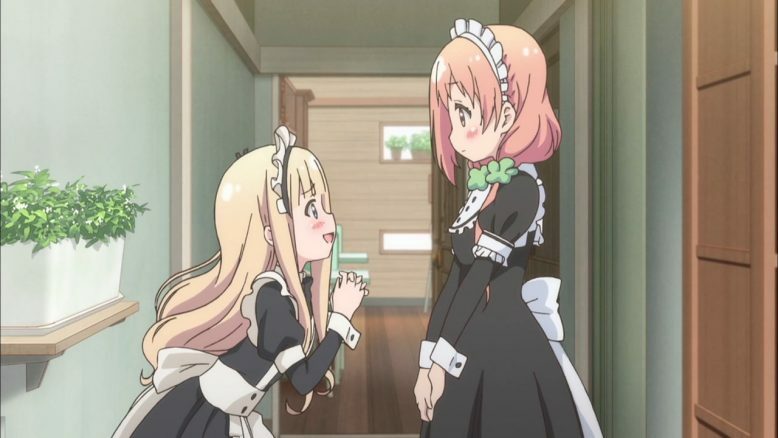 Hinako really appreciates someone stepping in and covering for her when she’s unable to handle things properly, so Yua’s attempts come across to her as kindness. 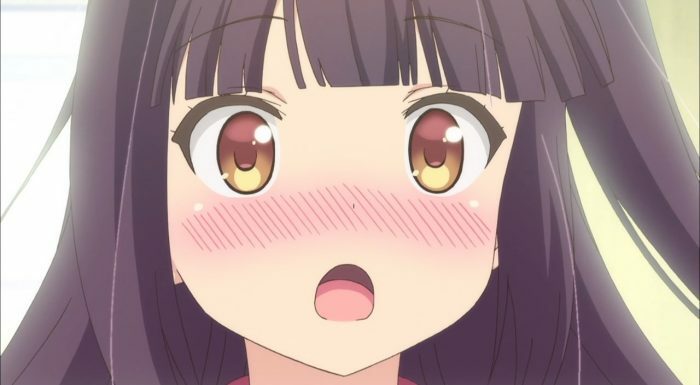 Seeing Yua’s confusion and embarrassment when Hinako thanks her and asks to be friends with her, when Yua had been afraid that she’d been so mean that she’d unintentionally scared Hinako away from coming to school at all… that’s a good moment. I like that a lot. Going back a bit, it appears that Yua’s fascination with Chiaki is not unique. It seems the former members of the theater club, self-described as Chiaki’s fans, were so upset about not being able to see her act, and so concerned about her being depressed by not being able to act, that they created their own organization, calling it a theater society, so that Chiaki would still be able to act at school. I have to admit I am rather curious to see her onstage now. I have to wonder what sort of acting could earn her this kind of fanbase. 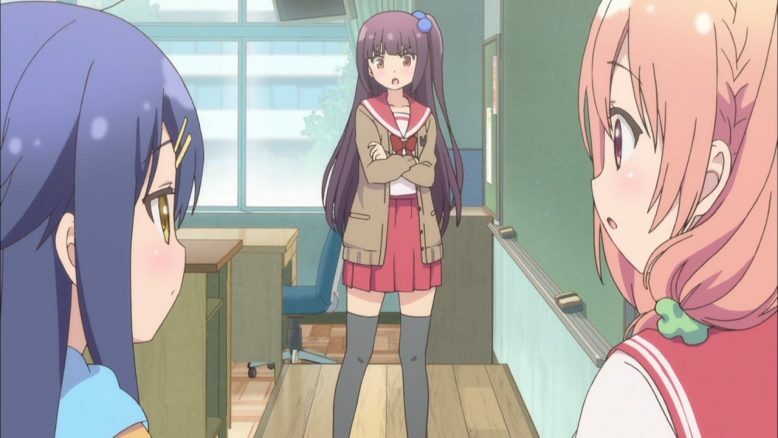 Regardless, she immediately heads over to the first year classrooms to invite Hinako and Kuina to join… which, of course, is what draws Yua’s attention to Hinako. But putting that aside, it’s pretty amusing that, after all the thought they put into starting their own theater troupe so Hinako could still act without a club at school, as soon as school starts up there’s effectively a replacement for the club, and suddenly this shy girl is scheduled for twice as much theater work. 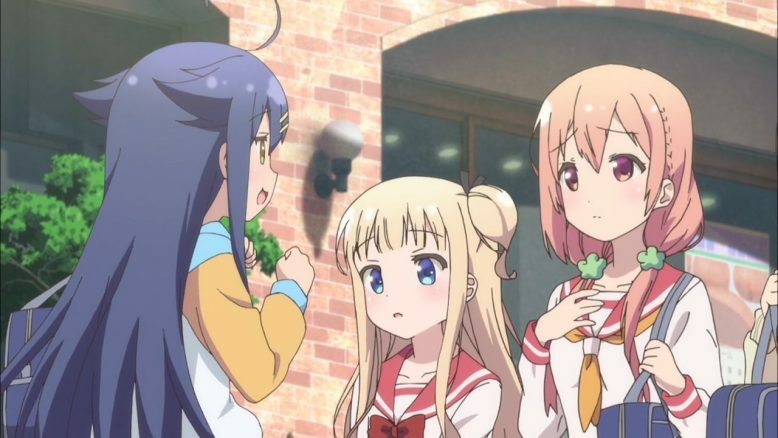 To try to help her work her way up to it, and to fulfill her responsibility to work in the shop, the other girls convince Hinako to join Mayuki in the cafe on their next day off from school. Fortunately the cafe is not busy, but still Hinako can’t help but be nervous. The fact that Mayuki is clearly more interested in dressing Hinako up in flashy costumes than in actually having her help out probably isn’t a comfort either. Still, her ventriloquism act with the bird that follows her around is pretty funny, and seems at least convincing enough for the lost child to be fascinated by it. I wonder if Hinako got the idea from Kuina using ventriloquism through her to talk to their classmates. On the other hand, she still couldn’t speak properly to the poor girl’s mother. Don’t let it get to you, Hina-chan! I wasn’t sure whether or not to expect any more of these bath time contemplation scenes like we had in episode 1, since there wasn’t one last episode. But here they come again, and it seems they may well turn into a thing. Certainly there’s some fanservice appeal there, and I’ve heard that the manga also apparently has a surprising amount of that for a cute girls doing cute things series. However, even with that aside, I believe these moments are pretty important. They allow Hinako to be by herself and just go over what’s happened to her, how she feels, and what she wants to do. We’ve seen multiple times now that she can’t think well under pressure. When people are talking to her she has trouble forming a response, and even if she manages to hold a conversation and not get overwhelmed she still is more likely to just agree with any suggestions people might make to her because she’s too timid to respond differently. It’s only when she’s alone like this that we can really see her work through how she feels about things: what she really thinks and what she wants to do. Hopefully over time she’ll grow and start to overcome some of these issues. So, despite a bit of a rough start the newest girl Yua is ready to join the group properly, and just in time a new theater club-like-thing has opened at the school for everyone to enter. Hinako is struggling to deal with people in school, but she’s made one new friend (accidentally), and is determined to push herself forward. More cute times with acting and friendship and scarecrows await. And of course, after all this, who should sneak in in the background but the theater club’s advisor.